It has been proven that exposing children to books and reading to them at an early age can promote children’s language and literacy development. Love for books isn’t just about the words on the page—it’s about the physical objects too! Luckily, the love for books can be easy to foster from the time children are born solely by exposing them to books early on and on a continual basis. I often hear from educators that they are concerned that young children are rough on books. I see books kept out of reach of the children. An early childhood program is the perfect place to help children learn how to use and care for books. Yes, it is possible to teach the youngest of children to respect books. That isn’t to say that books won’t get ripped, chewed on and mishandled. In fact, this is a positive thing. These occurrences are teachable moments. The following are occurrences that can be turned into teachable moments and will support children in learning how to care for books. Reading books should occur more often than just at group time. When children have access to books, they will bring books to teachers to be read. This can begin in an infant room by finding time to read with infants one on one. I have seen teachers read books while holding an infant who is taking a bottle or inviting children to sit in their lap to introduce a new book or an old favorite. As a toddler teacher, all I had to do was sit on the floor and children would bring books to me. I didn’t have to have a formal story time because we were reading throughout the whole day, including getting ready for nap time. Allowing infants and young toddlers to mouth objects is okay. Mouthing is important to their development. The mouth is the drive for life. When we are born our drive for survival is undeniable. Infants cry and search (known as rooting) for sustenance which satisfies their needs. This drive is so deep that it takes most children a long time to move past it. I would challenge that this need never goes away. Think about the joy of tasting your favorite flavors, chewing a cup of ice, or enjoying your favorite gum or candy. Do you prefer certain textures of foods over others such as crunchy vs. creamy? One solution is to provide cloth and vinyl books. They can be mouthed with no damage and are easily washable. Board books are also sturdy and wipeable. Mouthing them will deteriorate them over time therefore it is okay to say, “I see you are putting the book in your mouth. You can put this toy in your mouth. (Offer an appropriate toy) or we can read the book.” Offer the child to sit in your lap and enjoy the book together. Children are natural explorers which explains why they are curious about their surroundings. They also do not know their own strength nor have any clue about what is “socially acceptable.” Adults can take note of this fact and decide how they react to children who are simply doing what comes natural to them. The act of exploring needs to be guided not dictated. In order to know how to respond to children’s curiosity, it is important to remember to think in terms of what the child is trying to accomplish. In my experience in providing the opportunity to explore books, I noticed that when books have the slightest tears they do not go unnoticed to children. Their initial instinct seems to be to peel back on the layers that are unraveling on the board book or bend the spine of the book back until it cracks. The first few times this happens they do not know what the consequence of peeling or bending will be, therefore they will test it out a few times to see if they get the same result. Our response to exploration will also be tested, which means consistency is key. A response that seemed to help children was to calmly point out what was happening to the book and that we wouldn’t be able to read the book if it was torn or broken. Remember to keep an even tone and do not overreact. A lot of damage that happens to books can be fixed. If damage occurs; include the child in helping fix the book. Clear packaging tape works wonders when it comes to repairing books. Children of all ages should have a variety of books within reach throughout the day. If you need ideas on what types of books to have in your program, check out my previous post—and remember, many libraries have educator cards with perks that may include wear-and-tear forgiveness! Physical access to books is an important foundation of early language and literacy skills. This entry was posted in Best Practice, Family Child Care, Infants and Toddlers, teachers and tagged books, early literacy, library books, read aloud, reading with children on September 11, 2017 by Jamie Webb. I spent many years working in a classroom as a lead teacher. I LOVED my time working with children and am often asked if I miss being in the classroom. Upon reflection I discovered there are a few things I truly wish I could share with children again. One of the fondest things I experienced with children was reading aloud and sharing books with them. I loved watching their faces as we read together and learned the story of so many characters. Whether it was helping the peddler retrieve his caps from the mischievous monkeys or watching everyone being woke up by the flea in the Napping House, I was in heaven reading with my students. A report by the Commission of Reading titled Becoming a Nation of Readers states “The single most important activity for building knowledge for their eventual success in reading is reading aloud to children.” As child care providers, think of the impact you can have with the children you serve just by reading aloud with them once a day. I have found, however, that many teachers are uncomfortable with reading aloud to children. They are afraid to step out of the box and “become” the character in fear of looking silly or doing it incorrectly. Reading aloud might feel unnatural. 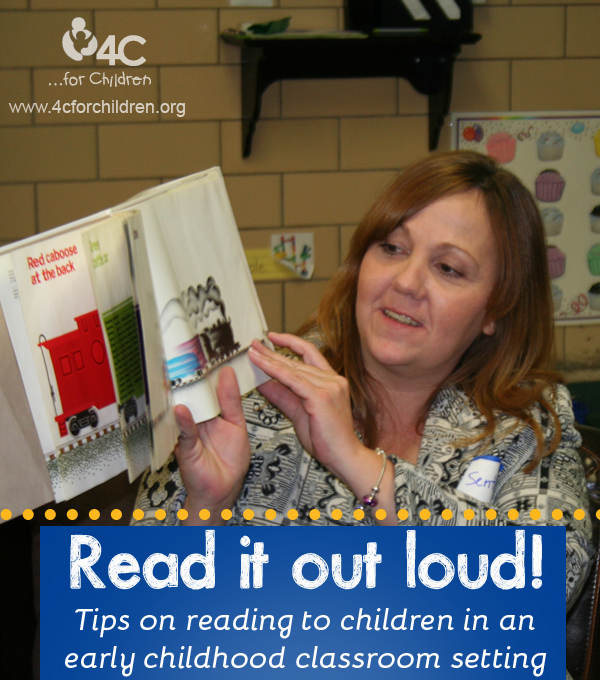 In an effort to help teachers become more comfortable with reading aloud below are some tips to help story time be a rich and meaningful experience for everyone. Be mindful of your audience and choose a story that matches the intellectual and emotional level of your students. Predictable stories and stories with lots of repetition are perfect for preschoolers. Fairy tales and chapter books are great for older children. Choose stories you loved as a child and are excited to share with your students. Your enthusiasm will be contagious! Practice reading the story aloud before sharing it with your students. Practice will give you the confidence needed to read aloud with emphasis. As you are practicing, think of examples and real-life situations to help build the background knowledge of your students and ways to help them relate to the story. Also, try to develop some open-ended questions to reinforce comprehension. Use your voice to paint the picture. Your voice can be used as a prop. It can be loud or soft, fast or slow, high or low, angry or kind. Your voice can express rhythm and rhyme and can be music to the ears of your audience. Facial expressions and body language are crucial. Facial expressions and gestures can help children understand new vocabulary. Encourage children to interact by using the gestures to describe what they see in the pictures, repeating phrases, or having them mimic your facial expressions. The more involved the students the more they will learn and the more they will comprehend of the story. Lastly, make the book available to students after you have finished reading it. This important step allows children to look at and interact with the story on their terms and at their pace. Children can reflect upon the story and relate it to their world. Reading aloud is one of the greatest gifts we can give to children. As child care providers we have the opportunity to show children the world by simply opening a book and sharing the love of words and pictures. I encourage you to take the time each day to share the beauty of our world through books and reading aloud. This entry was posted in Best Practice, Infants and Toddlers, Preschool, School Age and tagged read aloud, reading with children on January 27, 2014 by Patty Taylor.